Get it? Hed-ing? In a story about Hedwig and the Angry Inch? It’s a pun, A PUN! Carrie Sadshaw would be so proud! And I probably should have switched to decaf before writing about this glorious news! Seriously, it’s hard to type when your eyeballs won’t stop vibrating on account of those few too many cups of coffee and and the rush of adrenaline brought about by PURE EXCITEMENT, but I digress. The New York Post is reporting that Hedwig and the Angry Inch will be coming to Broadway this fall with all of its principal artistic forces intact. 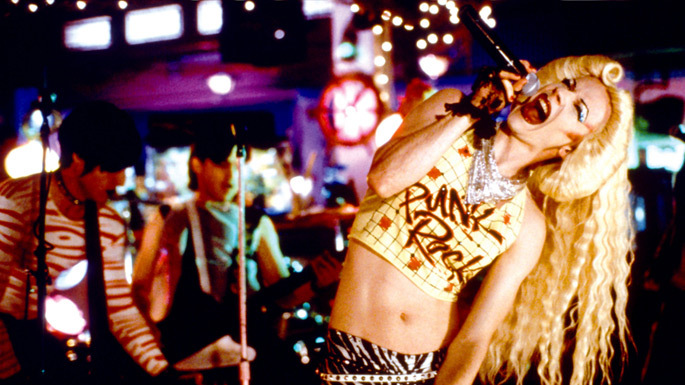 John Cameron Mitchell will be reprising the role of everybody’s favorite botched-job transexual rocker, and Steven Trask will be adding additional songs and musical material. Added to that, David Binder and Peter Askin will be returning as producer and director, respectively. One thought is to fashion a story line that has Hedwig playing a one-night-only gig at a Broadway house. The previous show hasn’t moved out yet, so Hedwig is scrambling around an old set. I recognize that the Hedwig revival is months away from opening, so there’s plenty of time for the production to go in a different direction, but this particular vision for the Broadway production sounds ingenious. After all, the only performance space more rock and roll for an East Berlin transexual punk rock star than a shut-down Broadway house is an up-and-running Bilgewater’s. Seriously, my venue suggestions are either the Hilton Theater (which would probably make for an amazing show because of the partially built sets of Spider-When?-Man: Turn off the Dark) or the Red Lobster in Times Square (which would definitely make for an amazing show because of the cheddar biscuits), but I’m not going to be picky with this one. Anywhere, and I mean ANYWHWERE, will do. Thanks to Mark for the exceptional news. This entry was posted on Wednesday, March 31st, 2010 at 2:27 pm and is filed under News and Theater. Tagged: Broadway, Drag, Hedwig and the Angry Inch, Homo Things, John Cameron Mitchell, Musicals, Rampant Enthusiasm, Red Lobster, Spider-Man: Turn Off the Dark, Stephen Trask, Teddy Bears, Theater Queens, Trannies. You can feed this entry. You can leave a response, or trackback from your own site. I want the bear! And I want to go see it!!! !